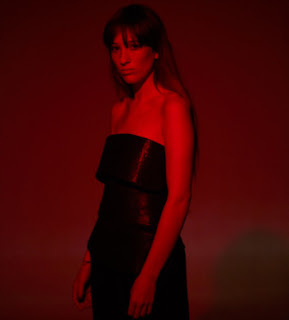 Background promo - After high triple j rotation of her first single 'Understand' and the seductive follow up 'Pink Flowers', Sophie Lowe returns unveiling her vulnerability in her latest track 'Breathe’. Taken from her 'EP 2', 'Breathe' sees Sophie expose her inner thoughts about life, love and confidence, in turn creating this powerful, provoking electronica jam. Sophie said, "I wrote 'Breathe' at a time in my life when I struggling to feel comfortable within myself and my surroundings. I wanted to talk about anxiety with this song because I feel its not talked about enough." Sophie has launched into 2016; soon to be starring in the film ‘Waiting for the Miracle to Come' co-starring Willie Nelson and Academy Award nominee Charlotte Rampling, starring in Flume’s latest film clip alongside the man himself for 'Never Be Like You ft. Kai’ and she was recently named by Italian Vogue as one of the ‘Australian’s to watch’ in 2016. The actress/songwriter was also recently featured in a full page Rolling Stone Australia editorial as well as being named 'One of their favourite artists of 2015’. Her videos for 'Understand’ and 'Pink Flowers' were added to rotation on rage, MTV Australia and Channel V.
In 2015 Sophie went from strength to strength supporting sold out shows across Australia with Meg Mac and Montaigne. Sophie Lowe has her sights set on 2016 working with new and exciting collaborators; Sophie Lowe is not a name to be forgotten. 'Breathe' has a simple but quite hypnotic rhythm, that works really well with Sophie's vocals. The song feels personal, there is enough emotion to draw the listener in, without overwhelming them. Background promo words - Fragile Creatures are a rock band from Brighton on a mission to restore Britain's reputation for original guitar music. Combining the very best of classic American and British pop and rock into beautifully crafted songs that will move you to the dance-floor and stick in your head. They are about to release their debut album ...And Other Wild things, the first release from new label Brightonsfinest Presents, due March 18th 2016. Band names can sometimes mean nothing, or come across as very silly. Or be so all-embracing that they too lose all meaning. Everything Everything? TV On The Radio? Vampire Weekend, anyone? Then you get something like Fragile Creatures which is a neat encapsulation of humans. Well, as neat as you can get within the limitations of a bands name. But it nearly didn't happen for this Brighton -based five piece: "There was a guy called Dave, who was investing in us and he said you should call yourselves Fragile Creatures, right from the off," remembers Adam Kidd, lead singer and guitarist. "We all said 'no'," Adam laughs at the memory of it, "Then a couple of months later I said halfway through a rehearsal: 'Guys! Got a great idea for the band name! Why don't we call ourselves Fragile Creatures?!" Indeed, such is the human way with appropriation and rights... But, whoever deserves the credit, there is no denying it is a great name for a band, surely that all but the most egotistical of us can relate to. OK so the song 'Stowaways' has been around a while and has already made a very positive impression on a good many people. It's a fine song and gives an indication of what's in store for us, on the forthcoming new album. Each of the dozen songs lives up to the bands aspirations, it's upbeat, lively and very pleasing. Jaggery - Garden. (From the album Crux). Background promo - Operatic ululations shiver above hand-hits on a wood box drum. A clamorous breakdown dwindles to a time-tick and a whisper. The latest offering from Boston band Jaggery — who’ve been creating entirely unique, genre-defying art rock for over a decade — begins ("War Cry") and ends ("Nijinky's Diaries") with extremes. Dramatic explorations of the dark corners of the human condition lead into the album's heart: the stripped-down title track "Crux," a chamber pop meditation on the confusing, beautiful mess of existence. Jaggery’s third full-length album is a swirl of storm clouds surrounding a quiet, contemplative eye. Crux marks Jaggery’s first collaboration with co-producer and engineer Jon Evans (who has worked with Tori Amos, Chris Cornell of Soundgarden, and Sarah MacLachlan, among others). Jon’s treatment has the band sounding better than we’ve ever heard them before. Singer Mali Sastri’s acrobatic whispers and wails are at once forceful and ethereal, often heard through the distinct sound of a copperphone mic. Drummers Daniel Schubmehl and Dylan Jack’s intricate, jazz-based rhythms pop and sizzle with clarity and articulation. Tony Leva’s dexterous upright and electric basses snap and rumble. Rachel Jayson’s avant-classical viola dances, sings, and scratches, always with elegance. And Petaluma Vale’s Celtic harp glistens and shimmers with thoughtful, well-placed accents. 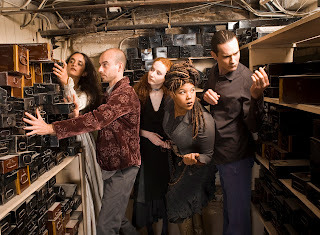 Jaggery formed in New York in 2004, and relocated to Boston in 2008, where their live shows often include visual artists, storytellers, dancers, and aerialists. The band’s interest in aesthetic cross-pollination is evident on Crux. Four songs came out of a collaboration (Ten Paintings/Ten Songs) between Mali and painter/theater director Steven Bogart (“War Cry,” “Garden,” “Icy,” “Venus in Transit”). The alternately smooth and jagged track “This Way That Way” was commissioned as part of a song cycle for a Leonardo da Vinci exhibit at the Museum of Fine Arts, Boston in the spring of 2015. The agitated “Raskolnikov” is an ode to Dostoevsky’s Crime and Punishment protagonist. And the lyrics of the album’s climactic closer “Nijinsky’s Diaries” are taken from the journals of the eponymous ballet dancer of the early 20th century, who inadvertently documented his own descent into schizophrenia. Jaggery’s unconventional sound has consistently eluded easy genre classification. “Restless chamber pop,” “avant rock,” and “darkwave jazz” have all been proposed. Whatever label you choose, this amalgam of piano, viola, harp, bass, percussion, and what boston.com calls the “mercurial majesty” of Mali’s voice holds its own ground and speaks for itself. Crux immediately clarifies a recurring tendency of Jaggery’s music: it’s not there to placate crowds. Jaggery challenges listeners: through subject matter, instrumental arrangements, and the visceral power of a voice with zero qualms about exploring the full spectrum of uttered human expression. With arresting skill, sui generis originality, and unnerving beauty, this album cuts to the crux. I first heard some of Jaggery's music two or three years ago. Their genre defying sound never fails to impress me. They experiment, test boundaries, and yet never come across as indulgent. 'Garden' is but a small taste of what to expect on the album. It's music as art, or possibly art as music!